Patricia Lundy explores the relationship between women and death by reflecting on two books. Smoke Gets In Your Eyes: And Other Lessons from the Crematory, Caitlin Doughty’s memoir on her experience (past and current) in the death industry and Susanna Clarke’s Jonathan Strange and Mr. Norrell, with specific focus on Lady Pole. In this post Patricia entertains the idea that death is an important facet of female identity, and when it is stripped away, this identity, as well as female autonomy, is stripped away as well. Patricia Lundy is an aspiring speculative fiction writer. Currently, she’s working toward her Science Fiction and Fantasy Writers of America membership. Her blog Something Eldritch serves to indulge her loves of reading, writing, and morbidity. 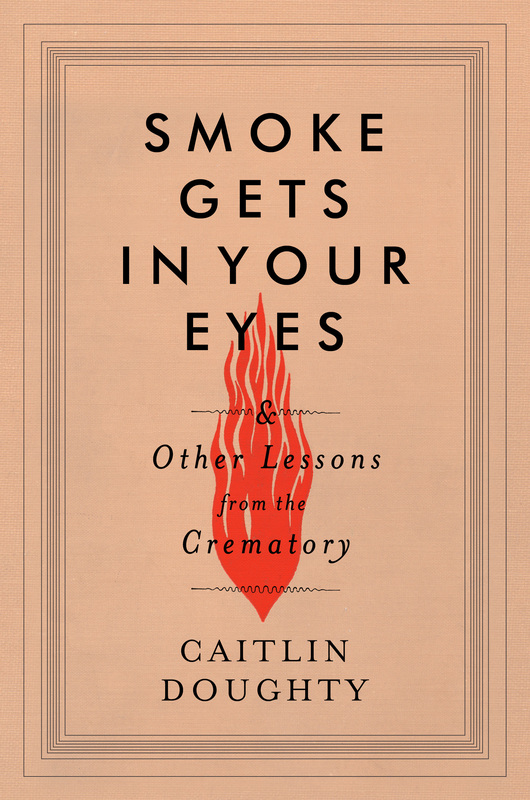 I recently finished Smoke Gets In Your Eyes: And Other Lessons from the Crematory, Caitlin Doughty’s macabre, delightful memoir on her experience (past and current) in the death industry. Her story is a morbid treat which I highly recommend reading, as its more somber, gruesome moments are nicely juxtaposed with mortician-isms, such as the enlightening powers of wearing “corpse-colored glasses” and the nifty piece of wisdom, “if at first you don’t succeed, slice, slice, again,” (the latter to be used only in regards to corpses, please). But as much as I would like to talk about the dark colored whimsies tucked throughout the crematory tale, today I’d like to focus instead on the connection between women and death, something Doughty briefly mediates on, and how this connection is also explored in Susanna Clarke’s Jonathan Strange and Mr. Norrell, specifically through Lady Pole. I’d like to entertain the idea that death is an important facet of female identity, and when it is stripped away, this identity, as well as female autonomy, is stripped away as well; when Lady Pole is effectively severed from her tie to death, she is rendered powerless. Let me begin first with Doughty. One of the main credos of her memoir maintains that death should not be a stranger to the general public, as this only serves to make people more afraid of death. In the Western world, few of us interact directly with death. It is kept far away from us, behind white linens and curtains and tucked away in secret, hospital-basement morgues and stifling homes for the elderly. Most of us no longer butcher our own animals, and so we are spared from even witnessing animal deaths. And when one of us does succumb to ‘the death,’ we are immediately whisked away by a complete stranger who then embalms us and returns us unrecognizable in neon colored makeup to our wake, or as ashes to urn. Though everyone dies, Doughty reveals that only a select group of people handle death. Only a select group of people are privy to what happens during house calls, mortuary visits, embalming, and cremation, and Doughty is effectively aiming to change that with her new venture Undertaking LA. Undertaking LA serves to return death to the home. Families are invited to be a part of the corpse preparation process, something that was the standard practice just one hundred years ago, when undertakers were merely the people who would sell you the coffin. Instead, it was the family who prepared the corpse for burial. This process includes washing the corpse, dressing it with care, and placing it in the coffin, no embalming necessary. Doughty argues that this is an essential part of the grieving process, allowing the mourners time to process the death, and effectively helping them to let go of their loved one. Historically, corpse-caring fell into the domestic sphere; in other words, it was the women who were responsible for preparing the dead for burial. “Women baked the meat pies, did the laundry, washed the corpses,” as Doughty succinctly states. Here is the place where she briefly meditates on the way that women are “death’s natural companions.” Women have the ability to bear children, and it is this very ability that inextricably links them to death, for as Doughty says, “every time a woman gives birth, she is creating not only a life, but also a death.” Her child, as every child, will eventually grow up to die. This link between women and death also persists in the sense that childbearing has historically been a dangerous operation for women, as a woman’s risk of death during childbirth or due to complications afterwards was notably high. Even in 2015 in the United States, maternal death due to childbirth is still an area of concern; one study claims that the number of women who die in childbirth in the U.S. is almost the highest it’s been in a quarter century. Returning to Doughty’s focus: women, historically, have been the people linked to birth and to death. Midwives were employed to deliver babies, and female layers-out could be hired to prepare the corpse for burial, if the family matriarch did not wish to do so herself. But what happens when the natural role of women in death begins to disintegrate, such as when women no longer handle the business of corpses in the family sphere? Or when a woman is forcibly severed of her tie to death? Her autonomy as a woman, as well as her power, disintegrates, sometimes completely. Such is the case with Lady Pole, the young, beautiful Lady Pole (prior to her marriage – Miss Wintertowne), who is damned to sickness and dies at nineteen, just days before her wedding. It is the famed English magician Norrell who revives her, and who uses this opportunity to prove to society his “extraordinary powers” and thus, cement his status as a respectable magician. It is not Lady Pole the Englishmen are concerned with. It is magic. It is power. It is effectively stripping Lady Pole of her own power. She is not consented in the matter of whether or not she should like to be brought back from the dead; it is assumed that because she died young, she died tragically, and of course she would rather be alive. I must point out how eerily familiar this sounds to people whose DNR’s are not respected, or to those whose wish to end their lives early due to the horrors of a terminal illness – one that will rob them of their mind, identity and peace – but who are not given the freedom or resources to do so. Norrell effectively severs Lady Pole from her right to die without her consent, and he does this by striking up a bargain with the gentleman-with-thistle-down-hair, a dangerous and powerful fairy. “Grant me half the lady’s life and the deal is done,” says the fairy. Mr. Norrell agrees – and with that, Lady Pole is taken from death and restored to life. It is alarming, the way her life is bargained with, as if it were a block of cheese. Oh, just a finger will do! I’ll exchange this lovely cheese, er, woman, I mean, for a pinky finger. Fine, sir, thank you. Yet this bargaining between two men remains consistent with the way women have historically been treated – as property. Removed from the secure autonomy of death, Lady Pole’s life is no longer her own, and she becomes something less and less of her former self as the short lived joy of her re-animation quickly starts to dwindle. As her enchantment with the fairy progresses (which is upheld because of Norrell’s bargain) her temperament sours, and she successively spends her days by the window “pale and unsmiling,” and wholly melancholic and miserable. No longer is she a “sweet young woman;” her womanhood has been stripped from her. Not even her husband, the kind Sir Walter Pole, wishes to linger very long in her presence, as the presence of others disturbs her greatly (due to the fact that under the gentleman’s magic, she cannot communicate the condition of her enchantment to anyone, which serves to make her dreadfully unhappy). Lady Pole, risen from the dead, is a severely depressed insomniac who is a deep, aching hollow of her former self. Lady Pole cannot make this choice, however; when she tries to cut her wrists, her wrists are bound. She tries to restore her tie to death by murdering Mr. Norrell, but when this too, is thwarted, she progresses to an even more advanced state of misery when she is banished from London and committed to care in Yorkshire. At the end of the novel, she is again powerless to break her own enchantment, and must instead rely on the mercy of the men around her. She is nothing but a pawn to be used in power plays, effectively displaying Mr. Norrell’s and the gentleman’s, and even Stephen Black’s, prowess. Can we infer that if Lady Pole had been left for dead, she would have been happier? Perhaps. Spared an awful enchantment? Definitely. Retained her autonomy? Yes. Alas, we can only hope she spends the remainder of her life happy with Sir Walter, and that her tie to death is finally restored when she is afforded her right to die for the second time. Death comes for all of us, lest we forget. We can try to strip away its powers – or the powers of the people it is linked to – but our efforts will be for naught. Like Doughty says in her remarkable memoir, we can take comfort in the fact that we are all entirely equal in dust. No matter how rich you are or how healthy or fit, or how creative or skilled or important, you, too, will die. It is a sobering, refreshing relief, the very antithesis of megalomania.